Dr. Jim Tomkins, B.A. (Hon. 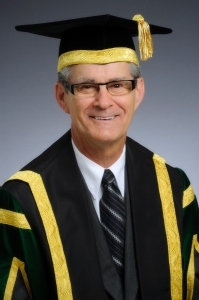 ), M.S., Ph.D. was re-elected in 2016 as the eighth Chancellor of the University of Regina. His first three-year term as Chancellor was held from July 1, 2013 to June 30, 2016 and his second term will expire on June 30, 2019. Jim Tomkins grew up in Regina. After completing high school there in 1962, he enrolled at the University of Saskatchewan in Saskatoon, where he earned a Bachelor of Arts (1965) and an Honours Certificate (1966) in mathematics. He then went on to complete his master’s (1967) and doctoral (1970) degrees in statistics at Purdue University in Lafayette, Indiana, USA. Dr. Tomkins joined the faculty in the U of R’s Department of Mathematics and Statistics in 1969. During a career at the University spanning nearly forty years, he served as President and Vice-Chancellor from 2007 to 2008, Vice-President (Administration) from 1998 to 2005, as head of the Department of Mathematics and Statistics from 1985 to 1994, and as an advisor to the President from 1980 to 1985. He has chaired the University of Regina Faculty Association, and was a member of the committee overseeing the University’s academic and administrative pension plan for almost 35 years. He also spent nearly four years on a secondment to the Government of Saskatchewan, serving as a Senior Policy Analyst on post-secondary education from 1994 to 1998. Dr. Tomkins had an active research career. He authored or co-authored more than 60 articles in mathematical and statistical journals. His research work was recognized and supported by the Natural Sciences and Engineering Research Council (NSERC) for 33 years, and he has chaired three different NSERC selection committees. Dr. Tomkins served as a Board Member of Regina Palliative Care Inc. from 1992 to 1998, as a Council Member of the Canadian Red Cross Society from 1994 to 2001, and is currently a Trustee of the Saskatchewan Healthcare Employees’ Pension Plan, President of the South Saskatchewan Community Foundation, a Director of Bentall Kennedy Prime Canadian Property Fund Ltd. of Vancouver, and a member of the Academic and Administrative Benefits Committee at the University of Regina. Dr. Tomkins was honoured with the Distinguished Service Plaque from the Statistical Society of Canada in 1990, the Distinguished Service Award from the Canadian Association of University Business Officers (CAUBO) in 2005, the Saskatchewan Centennial Medal in 2006 and the Distinguished Service Award from the University of Regina Board of Governors in 2008. Dr. Tomkins and his wife, Dr. Lynn Tomkins, reside in Regina. They have two children and four grandchildren.